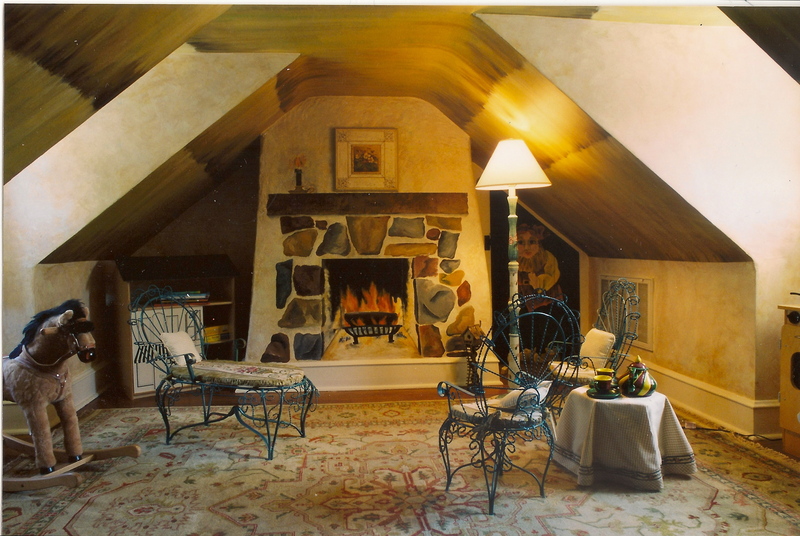 My relationship with the VIA’s Bucks County Designer House began when I designed my first room for the 25th Anniversary house in 2000. I was assigned an attic playroom, a small, hidden space that would intrigue, but not invite children. Perhaps because the angled ceilings made me feel as though I was a giant in the room, I immediately envisioned a dwarf’s cottage. I could see the trompe l’oeil fireplace on the real chimney and that ceiling became the perfect thatched roof. I completed the look with tiny children’s furniture that I refinished, and added hand painted birds as hooks for the dress-up area. One viewer said that she expected Snow White to pop through the window at any moment! Thus began my long relationship with this wonderful organization and event. Since then, I have done everything from stairwells to bathrooms to bedrooms. 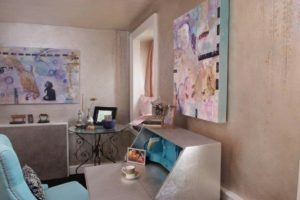 In most participating years, I have designed the entire room but I have also assisted designers with just faux finishing the walls in their rooms. 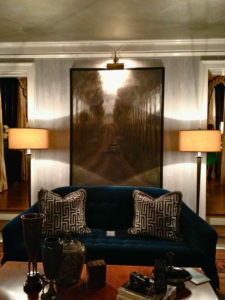 I assisted Gacek Design Group in creating show-stopping rooms. 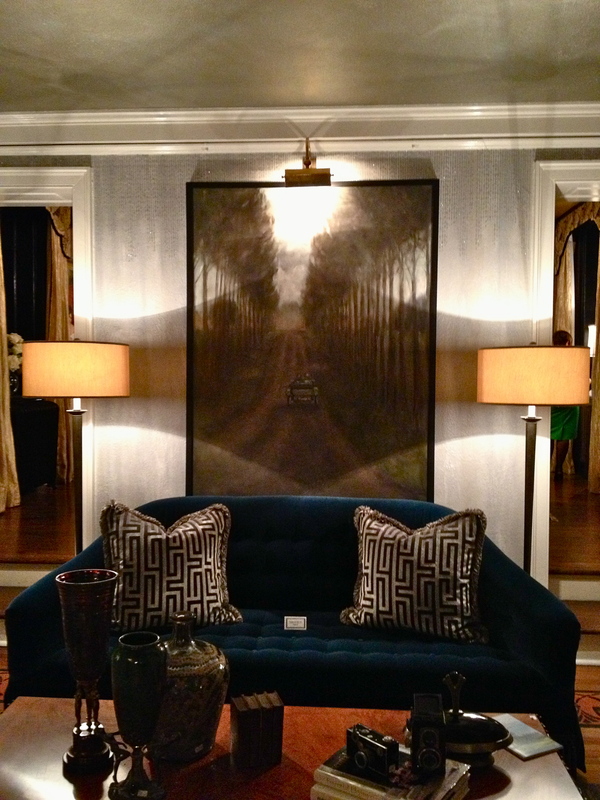 2013’s Beyond Gatsby room was glamourous and fun! 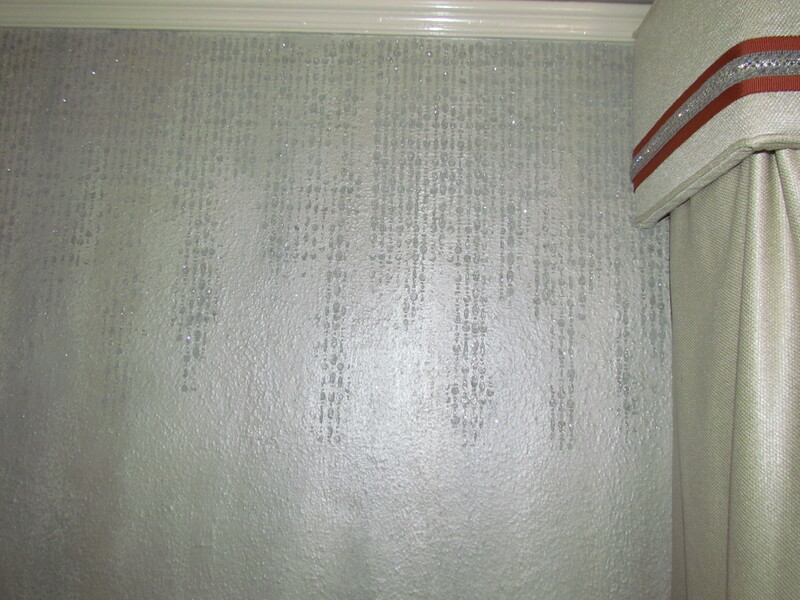 I created a unique wall finish that glittered like jewels on the wall, glazed the ceiling and created a large painting for the mantel. 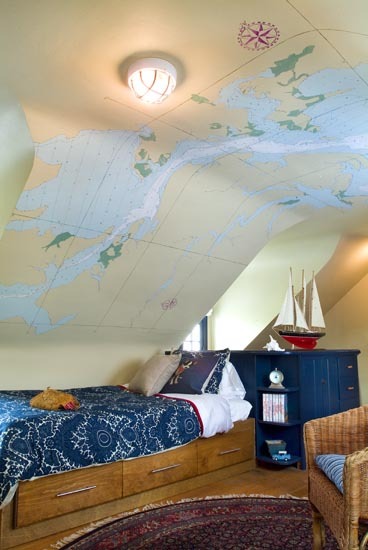 I worked on the designer house on Peddler’s Village’s Foxbriar where I designed a Sailor’s Loft boy’s bedroom. I guess I have become known for rooms with crazy ceilings and unusual shapes, but I am energized by the challenge. I had furniture custom built to get the most use of the space from a young boy’s point of view, and I hand painted the nautical chart mural on the ceiling, as well as the curtains, and fully accessorized the space. This room garnered enough praise to be included in two books: Designer Faux Finishing: Ideas and Inspiration for Sophisticated Surfaces by Victor DeMasi and Decorator Showhouses II. My woman’s sanctuary in the 35th VIA Bucks County Designer House was also published in another book, Decorator Showhouses III, showing that even a tiny room can have glamour and impact using beautiful elements. In addition to the VIA Houses, I have also participated with a fellow designer in the Holy Redeemer Health System Designer Showhouse, in Bryn Athyn.